The Olympic games are the world’s most famous international sports event. Olympics are a tradition, a place where heroes are made and where world records had been set. The participants participate with glory, pride and are eager to achieve their dreams. If you wanna know more about Olympics, keep reading! The names of the teams competing are among the funnest things about pub quizzes and they usually result in a good laugh. Sometimes, teams put in a lot of effort into coming up with their name: some teams change their team name every time they play, while some decide on one and can usually be recognized by that name on other occasions. Taking part in a pub quiz can be a lot of fun for both the participants and the quizmaster. However, running a pub quiz is much more complicated than it seems. It takes a lot of preparation and many problems can occur. To make sure your quiz is a hit and everyone has a good time, follow these tips! Trivia is a type of game in which players (who can play individually or in a team) are asked questions about different topics and they have to get as many correct answers as possible. 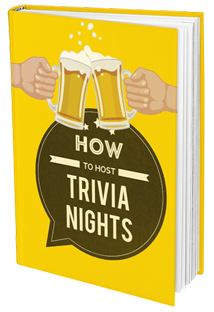 Trivia contests are usually organized as part of events, parties and as pub entertainment.